We can arrange all necessary transport needs for overland travel. Please find below a summary of the cars, which are available. The person per car suggestion is based on Western people with average size of luggage. If you travel with a guide you need to spare one seat. For more details feel free to inquire. Toyota Fielder. The budget option with plenty of space for two and a guide. 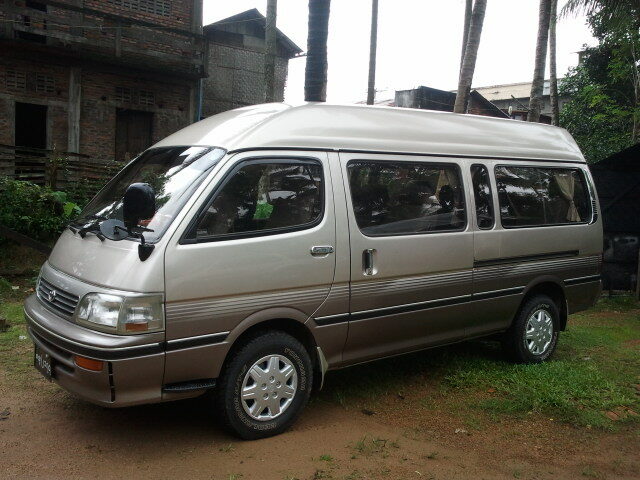 available all over Southern Myanmar and good for long distance transfer from Mawlamyine to Dawei for example. Toyota Prado 4WD. The best choice to travel around Southern Myanmar for 2 people as roads are bumpy and rocky. Great space for luggage. Toyota Super Custom. Best option for small group. Very generous leg space. The 4WD option comes in handy, when going off the beaten path. For up to 4 people. Toyota HiAce Grand Cabin. Best solution for big groups up to 6 people. Great leg space and head room. Toyota Commuter. Best choice for bigger groups. Comfortable seating. New model. For up to 9 people and their luggage. If you like to travel like locals or just going to have a day trip around town. Below are the main options. Hi Jet cars can fit up to 7 people. It is a great and quick way to explore the surroundings of a city. Some of them have already speakers so bring your favorite music. Tuk Tuk's is the local way to get around the inner city. It is the most local use transport for bigger groups. It can hold up to 7 or more people.